Figured I would just C/P my last post as a starter. The last thread is still stickied, but also locked. Also got the M1 Atragon finally. The top is bent like someone else noted, but the application of some boiling water (when I've time...) will assist with that. A Marmit G2k molded in black. Nice. Except that the head is attached the opposite/upside down way. It wasn't flipped after mfg either, as the sprays down the body onto the head are continuous. 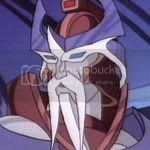 Plus Mike J told me he needs this variation, which gives me something else to hold over his head. And as one chapter (or thread) comes to an end, so a new one begins. Thank you, I'm tired of being told by a forum that a post I just made in a topic doesn't exist. This is an exclusive Bandai Eleking figure, Max Power Version, loosely based off use of his attacks in Ultra Galaxy and exclusive to Ito-Yokado. Lately I've become more of a fan of Eleking than I expected, and couldn't help but want this. 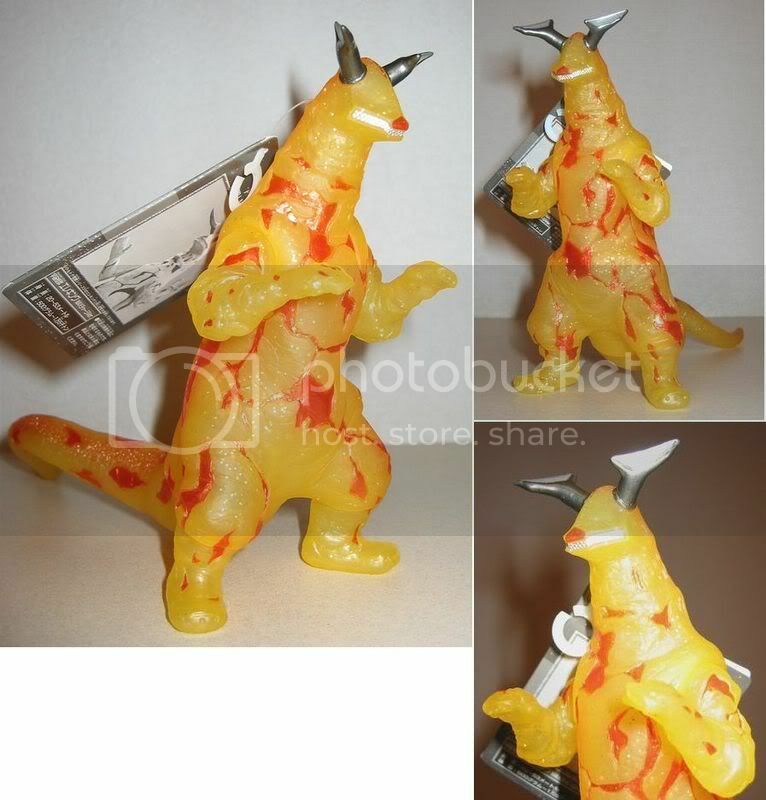 Goes great with my glow-in-the-dark Eleking from Ultraman Festival 2005. I got the Yuji Sakai "Concept Works" Burning Godzilla 1995 figure. It's quite larger than the "Complete Works" figures, and this one is pretty cool since it's molded in this glowing yellow vinyl with the black painted over, as opposed to the other way around, making the burning parts really "pop". With $13.99? Maybe. As someone (probably Legion) pointed out before, there are many other better versions of these same guys. I'm glad I didn't get the whole set. But if there is one to get from the set, it would be the '95. GiganGoji wrote: As someone (probably Legion) pointed out before, there are many other better versions of these same guys. 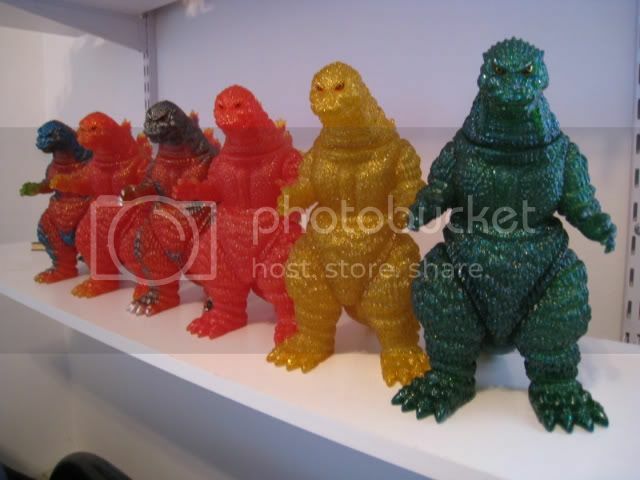 Maybe not better versions per se, but the '54, '62, '64 and '95 Godzillas seem to be the most frequently represented Godzilla styles when it comes to toys like these. I passed on this set, since the Complete Works versions were good enough for me. But considering we're back in the Bandai toy dark ages (it hasn't been this bad since the late 80s) ya gotta take what you can get, right? Bagged Bullmark mini Rodan. Really cool thing is that it has a Mirrorman header card. That Crocodile King is one wild figure! It's like they transplanted Biollante's head on a croc body. Earlier in the week I got in the mail a Tsuburaya/Yamanaya Absorba figure from Ultraman Leo. I've always liked this tentacled flying saucer thing! That Crocodile King is pretty cool. Very detailed. I usually see people post pictures of their Bandai King Kong and Bandai Mecha Kong in this thread(the prior one to be exact). What's the going rate for a Mecha Kong now? Where's the best place to get one outside of ebay? yea, that Croc King really does look cool and the head sure does look a lot like Biollante!! gforever wrote: yea, that Croc King really does look cool and the head sure does look a lot like Biollante!! Alpha OTS wrote: That Crocodile King is pretty cool. Very detailed. I guess your talking about my post. I really have no idea, I have not seen one around for quiet some time. The one in my photo was only to reference my newly acquired Kong and Gorosaurus Bandais, I got that fella about 9 or 10 years ago and even then could not find a dealer with one, so I got it off eBay. I can't wait to pop in the Godman/Greenman set. 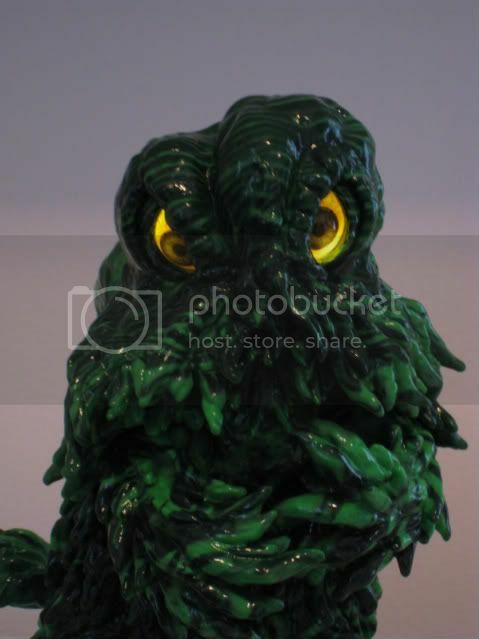 The Marmit GxMG Godzilla figure was one of last unique Monster Heaven figures I still needed. Oddly, by the tail joint there's a strange inscription etched in the vinyl as part of the mold. It reads "'03 G: Phase 1" followed by what looks like someone's signature. I wonder what that could mean. Alright, so nothing that's going to knock anybody's socks off any time soon, but I've got my share of goodies too. First up was my latest pickup from the House of Pop Culture - love that place. 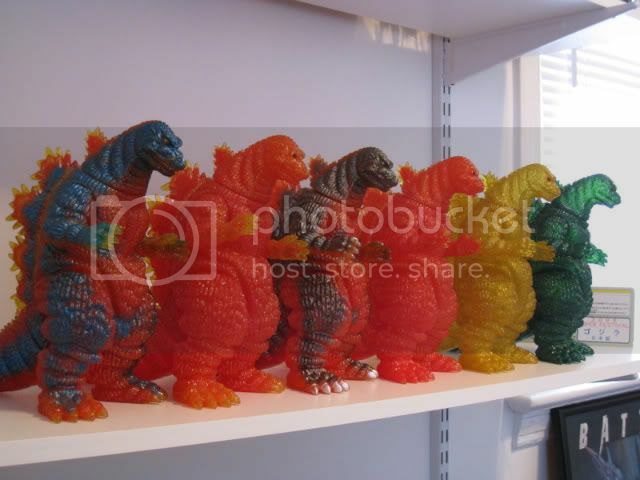 Somehow they got in a bunch of Iwakura figures, the second or third Godzilla set. I picked up a color Ganime and color Kumonga for just $7 each, not bad considering the premium colored figures can command. They're great, although one of Ganime's legs is warped and hinders his ability to stand. Make me regret selling off the ones I used to have all the more, especially Guilala and the bull-dude that came with the Gamera pendant. Second thing just arrived in the mail today. It's an EX figure, Kabuto Killer, from the current Daikaijyu series by Bandai. There does not appear to be any previous history to this character, so unless he appeared in an older Ultraman Fighting Evolution game like EX Gomora originally did, I'm guessing he's a brand-new creation like King Joe Black. 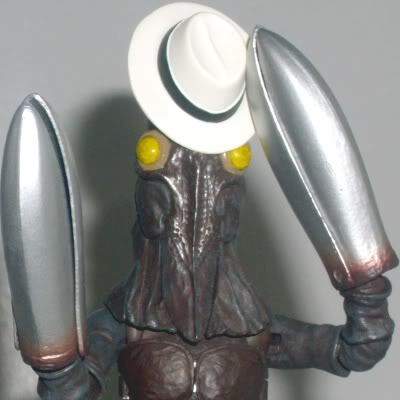 Kabuto Killer is probably slated to appear in the upcoming Wii game, and unlike previous EX figure Arch Bogal, does come with a spiffy game card for the DataCarddass system. As an aside, I wanted to mention that I picked him up - and preordered the upcoming Metron Seijin - from HLJ, and they've stepped up their game where mailing out kaiju are concerned. Haven't bought loose tagged figures from them since that 6" FW Gigan, and was amazed to find Kabuto entombed in air packets, but also stuck in a bag and board almost like you'd see people do for comics. I think enough complaints about the way they ship their kaiju have helped to improve their service and keep the business of people such as myself, so yay for that. Been 4 months without any G-stuff.... But being this deprived, I had to make up for the missed time! The Bandai Creation Kiryu was a Bday gift from Hesei, thanks so much man!!! and finally the local KBs have all the series 4 including the 12" Godzilla & Kiryus!! So I picked up the GFW Goji. A lot of people complained about the sculpt but I actually like it. Very articulative for those who like to pose their figs. The GMMG Polystone diorama with Goji vs 2 pissed off larvas is probably the best sculpted polystone I have so far. It was a freebie since the fingers and dorsal fin broke off but I carefully repaired it. The Valentine G-Cards are awesome! and I love the Ultimate Solid figs! Hedorah is huge and is super detailed! Ebirah & King Caesar are pretty nice but I'm getting to get sick of the GFW Gigan and Godzilla..... They are nice designs but we've been getting way too many of them..... I didn't bother opening the regular Goji since it's the same w/o the clear fins. I also picked up the Yuji Sakai Concept collection. I only opened the Burning Godzilla and it didn't impress me as much. Sculpt is ok but the painting is so so. The box art shows much more details and after mass producing the figs, it looks like the details in both the sculpt and the paint job were lost. The size of the boxes surprised me but I was a bit disappointed in the set as the figures were tiny compared to the box. Got a bunch of new toys today. Well, maybe not brand new, since it's all a bunch of variants. but some cool stuff nonetheless. First up is another Gigabrain Monster X. This figure is starting the grow on me, despite the bland pose. I really like the gold paint and this one is definitely my favorite of the four Monster X figures I own. There should be one more Monster X figure coming, the one with the standard paint job. Here's hoping Gigabrain puts out at least one more brand new Toho kaiju by the end of the year. 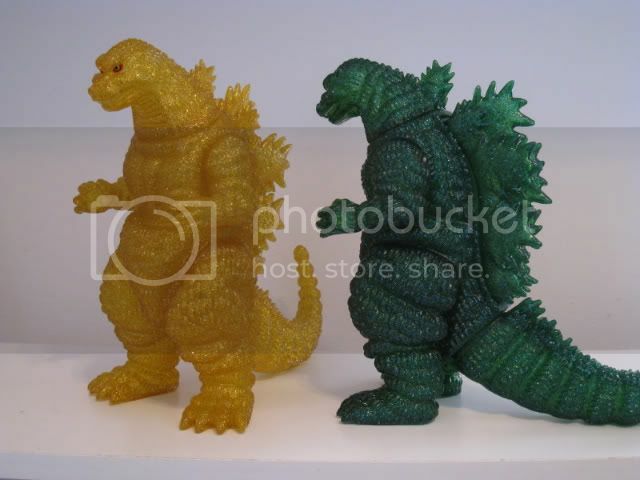 Next up are two more Marmit double-casted Burning Godzilla figures, which are actually a lot more impressive-looking in person than they are in these photos. The gold Super Fest figure is actually incredibly cool. 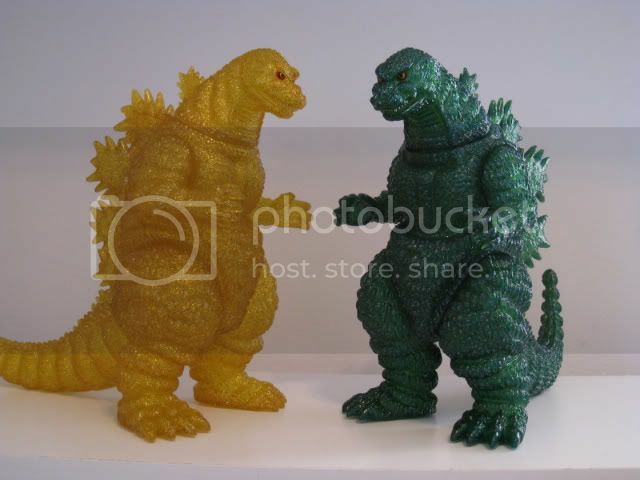 The green World Hobby Fest Godzilla is nice too but nothing spectacular. I really should stop buying these things but I'm completely addicted to them right now. And I'm going through Marmit withdrawal. I can't wait to get that Iron Joe Megalon. Finally is a figure that's actually new to me, and it should make Tim happy. 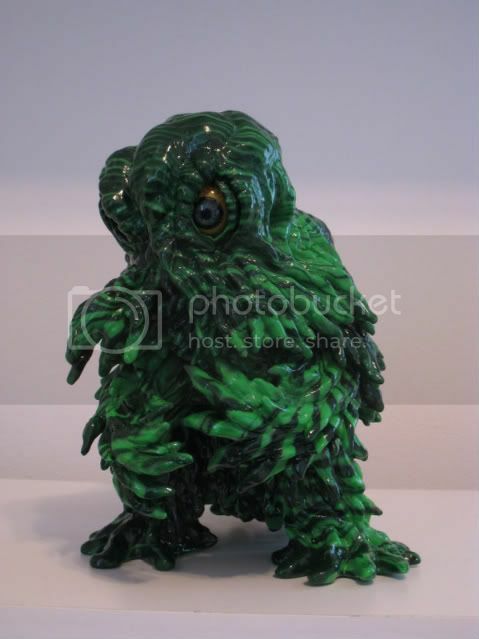 This is CCP's Kaiju Taro exclusive Hedora figure. This particular sculpt has been out for a while but I'm glad I held off as long as I did. While the sculpt is beautiful it's the colors I'm most fascinated with. I'm not even sure how thy made the figure look like this. Two color vinyl? And it goes without saying that the eyes are the absolute coolest thing about the entire figure, even though they're somewhat misaligned on mine. It looks like I could be able to pop off the front of the head and fix it but knowing my luck I'll destroy the figure doing so. "Kaiju Taro" is written around the edge of the pupils and it's so tiny I didn't even notice it at first. The eyes also light up and the smokestack has the "Daikaiju Taro" logo written on it. One thing I'm not aware of is the significance of this 'Kaiju Taro" thing. What does this mean? This figure jumps to the top of the pack and is definitely my favorite CCP figure. What does everyone think? wow, that hedorah is crazy. I think the eyes look fine. hedorah was always kinda crazy & googley eyed anyway. the color scheme is really neat though. I wonder if this might be a hint of what Deathla would look like if that 3D movie ever got made. God I love those Gigabrain Monster X figures. I really wanted the red one, can't find it though. I'd love to have the gold one as well. I'm considering shelling out the 89 dollars for the green one on the CT Marketplace. Although, that'd mean my car would be in the garage for about two weeks or so. Don't know if you realize it, Mike, but Kaiju Taro is an online store based in Japan that also caters to overseas collectors. I don't think the logo on the smokestack and the writing under the eyes is anything more than creative name-dropping. And man does that thing look incredible. I think they swirled two different plastic colors together to achieve that look it has, which I've seen done on other toys, but nothing nearly as impressive as this. Nice score. Love the gold Gigabrain X as well, probably the most appropriate set of colors they could have done aside from his actual appearance. The Marmit Monster X figs and the Kaiju Taro CCP Hedorah look really nice. I got the original HMV orange/green version and I love it. I agree that this is my fav in the CCP series. 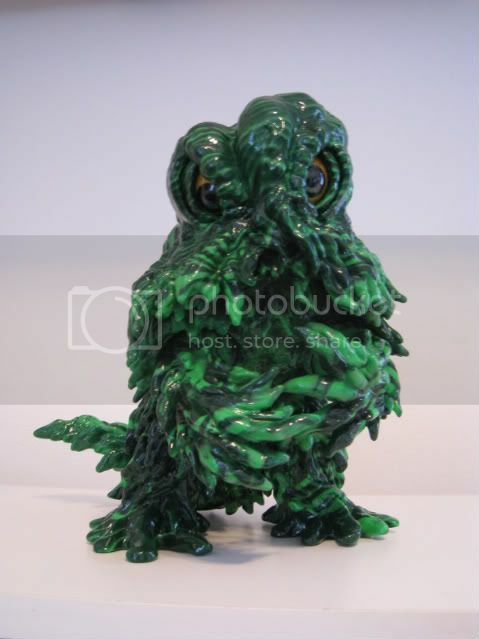 I also love the color scheme on the Kaiju Taro exclusive too! 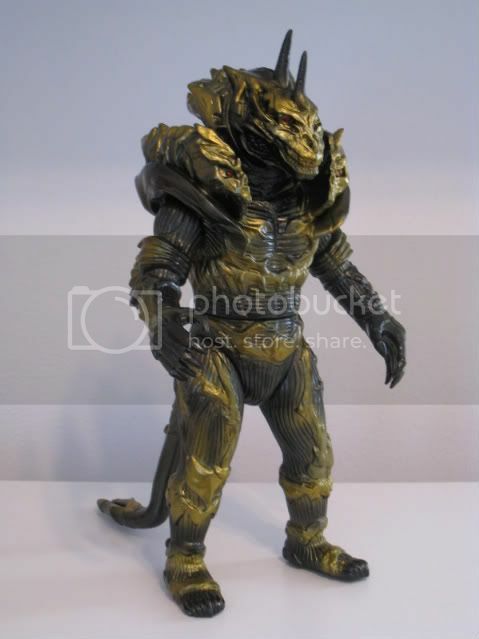 I know there is a second Kaiju Taro exclusive of the same fig but w/ different eyes. Did anyone pick that one up? So the Marmit Monster X standard color scheme hasn't been released huh? I too agree w/ giganzilla that this gold scheme is pretty appropriate as it looks like his transition from Monster X to Kaiser Ghid. gforever wrote: The Marmit Monster X figs and the Kaiju Taro CCP Hedorah look really nice. I got the original HMV orange/green version and I love it. I agree that this is my fav in the CCP series. 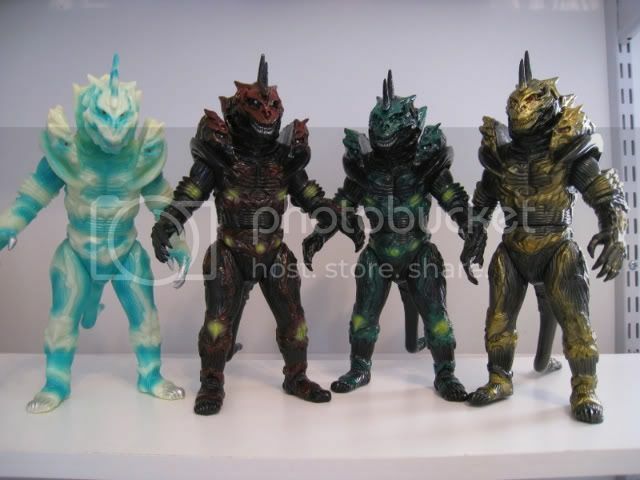 I also love the color scheme on the Kaiju Taro exclusive too! 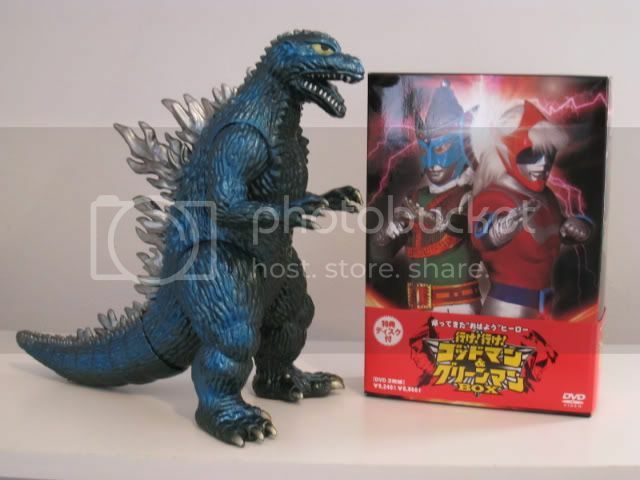 I know there is a second Kaiju Taro exclusive of the same fig but w/ different eyes. So the Marmit Monster X standard color scheme hasn't been released huh? Nope, not yet. I think it might actually be the mail away figure. And we all know how long it takes for Marmit and Gigabrain to get those mail aways out. Received a few days ago my Pandon figure tag #68 (2001) just waiting for his cousin King Pandon later this year. 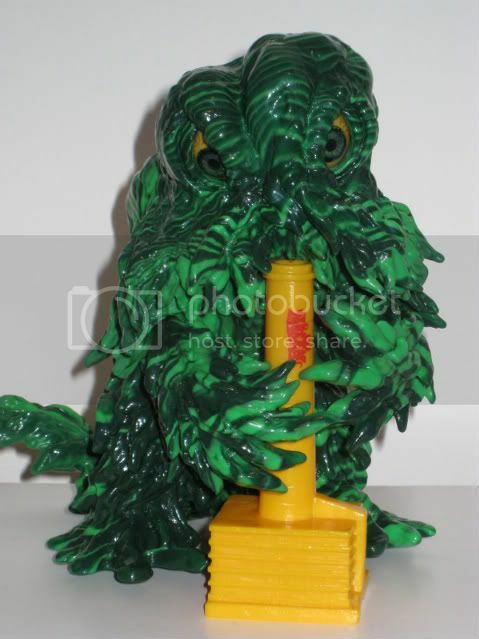 I found that awesome Hedorah on ebay. Of course Steve Agin is selling it, which means he's charging nearly twice its cost. briizilla wrote: I found that awesome Hedorah on ebay. Of course Steve Agin is selling it, which means he's charging nearly twice its cost. What a loser. Those aren't even his pictures. 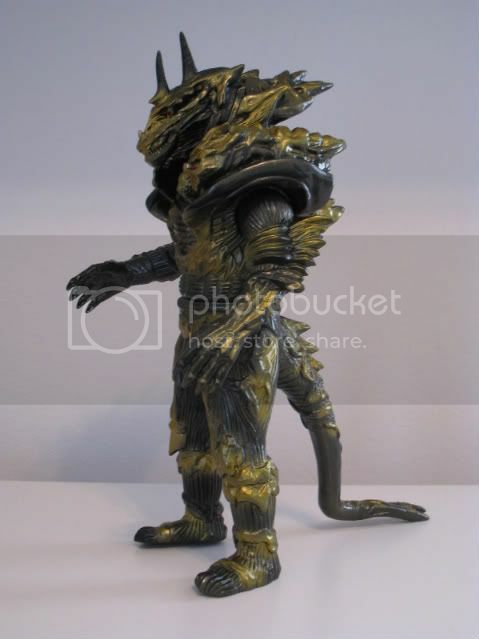 Doing a search for it on eBay myself, I remember seeing more than just Agin selling the Kaiju-Taro CCP Hedorah, and for better prices too. Unless they've all been sold by now?